Description: London, Society for Promoting Christian Knowledge 1889 approx. Frontispiece + 3 black and white illustrations by W.H. 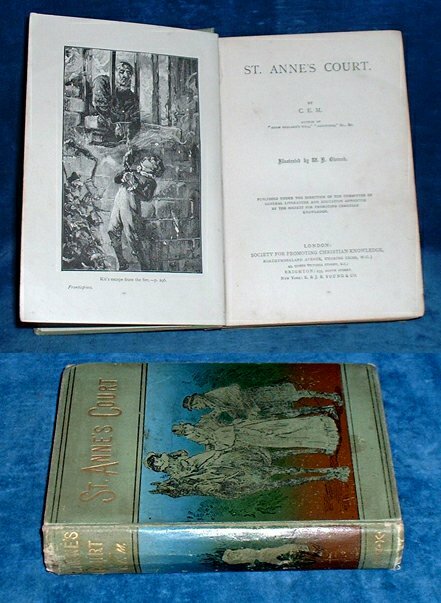 Overend (1851-1898). . Octavo green pictorial cloth with gilt lettering (tips bumped, edges and covers rubbed, some marks) 318pp +pp SPCK catalogue. Title with very small marginal tear, a few signs of use and 3 creased corners, otherwise a clean copy. *"St. Anne's Court, in the parish of Ringdown, is one of those beautiful old houses in which England is still rich .." but through time the family living in St. Anne's had to adapt to harder times. Keywords: Victorian children's religious moral story.